We’re sure that you are your parents will agree that there’s nothing better in the morning than a fresh cup of coffee! And this new system from Keurig makes it easier than ever to get that morning caffeine in. We don’t know about you, but oftentimes we find ourselves referencing Pinterest recipes while in the kitchen. Make your parents’ cooking endeavors easier with this cutting board/iPad stand hybrid. Here at Team LC, we’re smitten with a good coffee table book. This book is filled to the brim with Condé Nast’s most beautiful photographs over the past quarter century. You’re parents are going to love flipping through this with a mug of hot cider. This beauty fell onto our radar when we were creating these delicious recipes. Our lives haven’t been the same since! Inspire healthier (and fun!) cooking by gifting your parents a spiralizer this year. There’s nothing better than the ambiance in a candle-lit home. If your mom and dad are candle connoisseurs, then this gift is for them! Anthropologie has some of our very favorite candles and these fruit-shaped ones are no exception. Are your parents the entertaining type? These stunning marble-wood serving stands would be perfect for their next wine and cheese soiree or neighborhood get together. 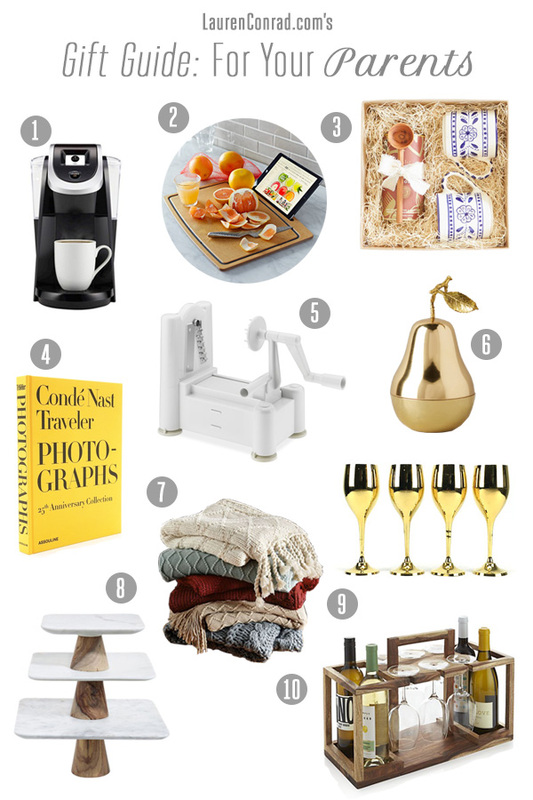 While we’re on the topic of wine, the last gift in the guide is pretty practical when it comes to wine storage. This caddy can store up to six wine glasses and four bottles of wine! What’s not to love? What are you surprising your parents with this year? We’d love to see your gift ideas in the comments below!